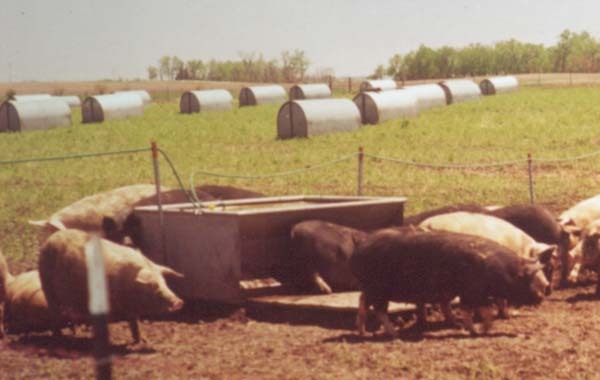 Pasture farrowing, being one of the oldest hog raising systems, can solve some of the problems brought on by high technology, namely pollution and energy. Modern systems will continue to have problems with waste handling and increasing cost of energy. Government regulations restrict use of drugs, which are more necessary in confinement than pasture. We should also be concerned about people's health working in a confined environment with hogs. Clean ground and green grass will eliminate almost all disease problems. No lagoons, exhaust fans, pits disinfecting, etc. 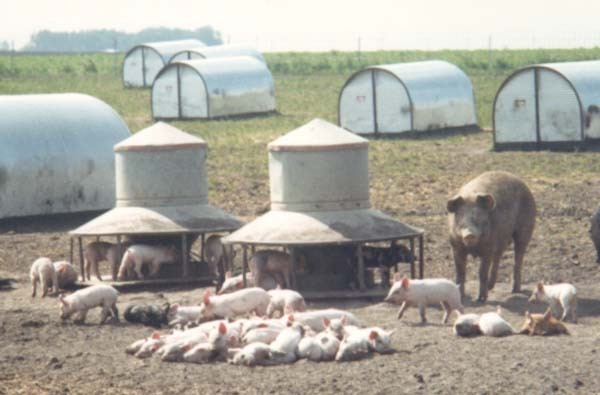 Huts, sows, feeders, and water should be put in the pasture a week before farrowing. Huts should be bedded with 1/3 bale of straw. Fencing cost will vary from an electric wire all the way, to woven wire, which will be your choice. A large shelter or two can be put in each plot to house sows before they farrow, keeping most farrowing huts clean and unused before the sow picks her own hut to farrow in. These large shelters can be moved to the next plot as soon as farrowing is done in this plot. The large shelters should not be bedded as the sows may choose to farrow inside them instead. Because of the green feed in the pasture, sows can be put on a self-feeder with a good ration without bulk and not have any farrowing problems. This keeps weight loss of the sow to minimum. 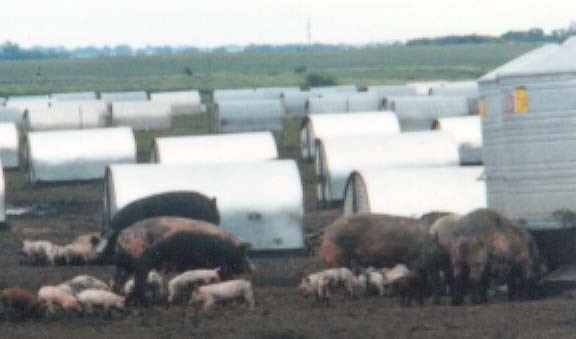 We recommend 15 sows and huts per acre. In this concentration you will find that sows will make a nest in a hut rather than out in the open. This would be a maximum of 60 sows to a 4 acre plot if they all farrow within 7 days. If not, you should have smaller plots to have pigs all farrowed in 7 days in the lot. We use pig rollers in huts to keep pigs in 10-14 days, which keeps the pigs from mixing and also making the sow return to her hut. 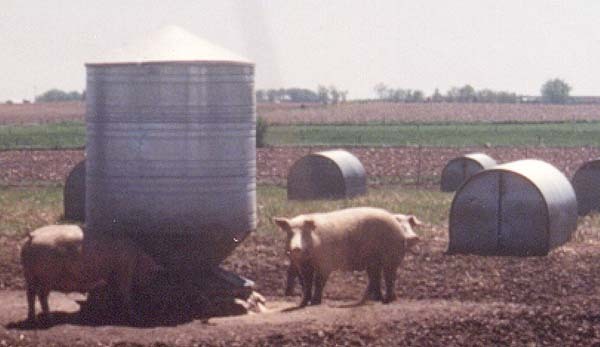 Rollers should be removed as soon as pigs climb over, about 10-14 days. Rollers can then be used on the next new litters, thus making the number of rollers a small percentage of the total huts, about 25%. We have a 3 year rotation in the operation. The first year is sows farrowing on alfalfa. The second year corn, to get the advantage of manure that was spread with no labor or equipment cost to you. The third year oats are seeded down. The fourth year back to sows and pigs. On flat or poorly drained land, you should put in permanent ridges when you are plowing for the corn crop. We use a moldboard plow and make a head land and a dead furrow every 30-40 feet. This may be a little inconvenient for large field equipment, but will pay dividends in the farrowing rotation. Placing huts on ridges will eliminate problems of heavy rain and extended wet conditions. If you have rolling or well drained land, this will not be a problem. We prefer a one litter system, farrowing a gilt in the spring and saving gilts from that farrowing for the next spring. Gilts which are one year old at farrowing time can be sold as capital income (pending tax change). A one litter system gives you a larger percentage of capital income per year, over a sow that is kept for several farrowings. Therefore, in a pasture system you can eliminate the problems of heating, cooling, and waste handling. Manure is all spread automatically with very little odor (another problem) and you can sell your product with an average price of all producers in the pork industry. they all have to come to a central feed and water station in each plot. Pigs are handled only one time at about 7 days old. The sow is driven out of her hut and pigs are worked on inside. Your capital is not fixed to any piece of real estate! The pasture system gives you the choice to stop production temporarily and farm the land with row crops, because of the low cost of equipment that would lay idle.If you want to quit for some reason (health, etc.) you can advertise this equipment and have it sold in a very short time. Because of its very portable nature, people from a great distance can buy and move it to their operation or farm. Huts can be stacked in piles of 10 or 15. Fifteen huts can be hauled on a pickup. Multiple farrowings of 2-3 or more can be produced in the pasture. You will have to have some other facilities to put sows and pigs in before weaning or a place to put the weaned pigs, and then you can use the same land and huts over again. In the warmer climates they can be used year around. In northern Iowa you can start to farrow by the middle of April and as late as October. Figuring only one litter per year, your cost of pasture buildings is only $2.68 per pig. At this time in a one litter system, we are taking our pigs from birth to market weight in the same huts and shelters they were born in. Therefore, you can figure a pasture building cost for farrowing, nursery, and finishing to be about $2.68 per market hog, or 1.09 cents per hundred weight. Our experience is that one man's labor per year can farrow and finish 600 litters or about 4,500 pigs. Certain times of the year you will need 2 or 3 men, but other times you do not need any labor. Figuring a yearly salary of $25,000 - producing 4,500 hogs, at an average market wt. of 240 pounds, the cost of labor is about $2.31 per hundred weight. An additional large shelter ($1300.00) may be needed for every 60 sows if you do not have other facilities for breeding or gestation. Feed cost will be about the same as other facilities except the time when your hogs have a green crop to graze from. During that time, your supplement cost can be cut to about 1/2. Feeder expense will be the same in any system. Water systems may cost more, because of extra pipe to pasture. This will depend upon how far pastures are from source of water. Boar expense will be higher in a one litter system because of keeping only gilts from your herd. This will require new boars every year. Interest cost on your pasture housing will be a very small fraction of any other system. You can figure a capital investment of $180.00 to $300.00 for pasture housing per sow. The pasture system not only gives you the advantage of low cost mentioned before, it also has the clean ground, green grass effect. It will eliminate the stress put on hogs in the confined set up. Sows and pigs are allowed to come and go at will. This will eliminate any feeding or water chores for you. We have never carried feed or water to a sow and her pigs or cleaned her pen for 35 years. Smaller operations will be just about as efficient as large operations in the pasture. The numbers used here are not a price list but an example of the approximate costs involved in a pasture hog raising setting.